Memberium supports GravityForms automatically. No special extensions, setup steps or settings are necessary. Below you’ll find detailed steps on how to implement GravityForms that will allow users to submit data to their Infusionsoft contact records. Unlike Infusionsoft webforms, Gravity Forms does NOT support the capability to autologin a user on signup. If you need a customizable web form that supports autologin, please refer to our [memb_registration_form] shortcode. Memberium allows you to use GravityForms to submit data to an Infusionsoft contact record. This is done through field mapping. 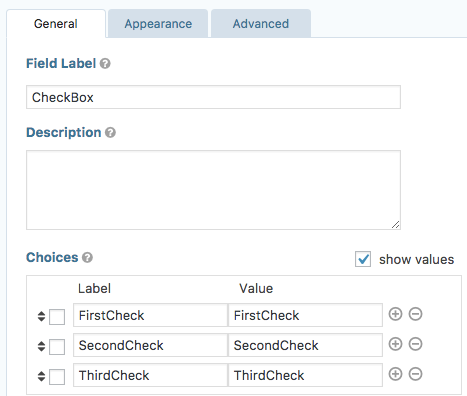 In a GravityForms field, you’ll want to map where the data is to be stored upon submission. To do this you’ll simply select the field of your choosing from the Memberium Sync dropdown. You can use any WordPress or Memberium shortcode in GravityForm’s “Default Value” field under the “Advanced” tab on the form field. You can use any combination of shortcodes to achieve the desired result. Please note that this is not the same input setting as the older dynamic population method. This is by far the easiest way to dynamically push autofill data into Gravity Forms it is also the most flexible, because you have full access to all shortcodes, and shortcode formatting functions. Memberium’s integration with Gravity forms is through a feature that Gravity Forms calls “Dynamic Population”, but may be more familiar to you as “Autofill” or “Autocomplete”. 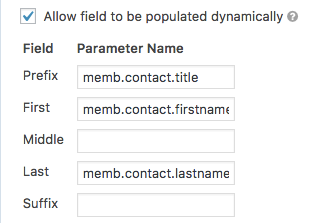 Dynamic Population allows you to dynamically populate a form field with a value. 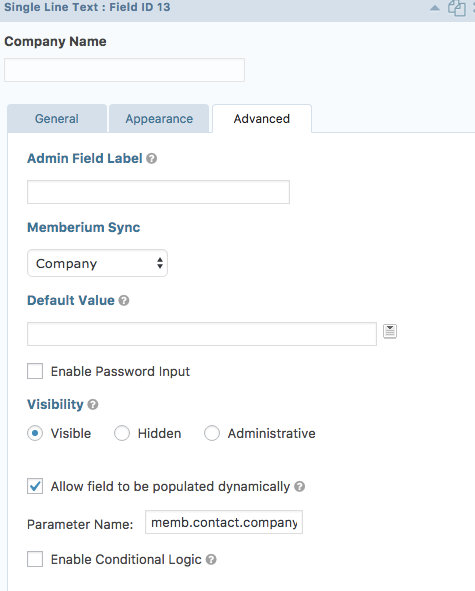 Through Memberium we provide Dynamic Population support for the currently logged in user’s Infusionsoft contact record information including custom fields. 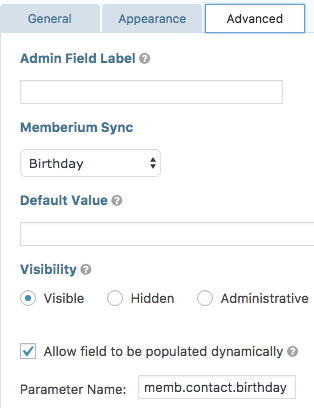 To specify a field on your form for dynamic population, click the “Allow field to be populated dynamically” checkbox on the field’s advanced tab. When you do this, it will display a text field labeled “Parameter Name”. The value you enter here will tell Gravity Forms which field to populate, and which value to use in it. Unlike shortcodes, please note that there is no  around the parameter names. If you need additional help dynamically populatulating fields please contact us at support. Go to Forms > Edit the form > Settings > Form Settings. On this page, scroll down and select a tag that you want to apply upon form submission from “Memberium Form Tag”. Once you’ve selected a tag, click on “Update Form Settings” button. Memberium will now add a tag to the contact when they successfully submit the form. Please note: If logged out users will be filling out this form, then an email address field will need to be on the form so that Memberium knows which contact record the tag should be applied to. Text fields are as easy as they get. 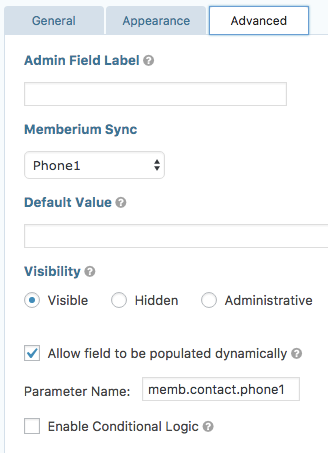 First, set the Memberium Sync dropdown to the desired field. In this case, we chose to use Company. First, set the Memberium Sync dropdown to the “FirstName” field. Even though there are up to 5 Infusionsoft fields being modified (Prefix, First, Last, Middle, Suffix) Memberium will automatically map those out so long as you have “FirstName” as the chosen option. Next, check “Allow field to be dynamically populated” and enter the parameters as described above. In this case, you’d want to fill in each box with the respective parameter. For my example field above, I only used the Title, First Name and Last Name. So here I would fill those in respectively as shown. Address fields have a very similar setup to Name fields. First, set the Memberium Sync dropdown to the “StreetAddress1” field. Just like before, Memberium will automatically link to all the other fields such as City, State, etc. as long as you have “StreetAddress1” set. Phone number fields are setup exactly as shown in the picture. These can be linked to the phone number fields in Infusionsoft. 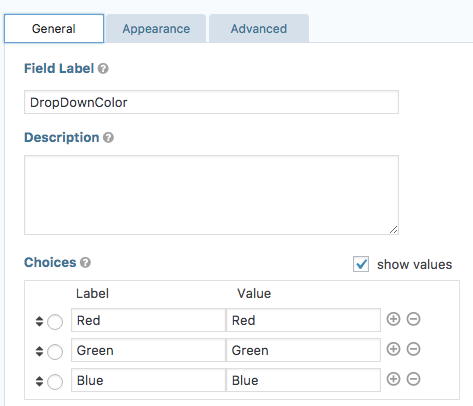 Dropdown fields allow your users to select from a predefined list of options. The setup is also very straightforward. First, in Infusionsoft, setup a custom dropdown field. Then, make sure in the GravityForm field settings (shown above) that you check the “show values” option. Make sure that the corresponding values match the values/options in Infusionsoft exactly. First, in Infusionsoft, setup a custom radio button field. Then, make sure in the GravityForm field settings (shown above) that you check the “show values” option. Make sure that the corresponding values match the values/options in Infusionsoft exactly. Alternatively, you can use the GravityForms radio field with an Infusionsoft Yes/No field by setting your options like the image below. First, make sure in the GravityForm field settings (shown above) that you check the “show values” option. Those values are what will actually be stored in Infusionsoft. Users won’t see these on the form itself. Date field allow your users to select a date and have that stored in Infusionsoft. In this example, I used the birthdate field, however, you could use a custom field also. Gravity Forms allows you to quickly and easily integrate with a variety of third party services such as PayPal and provides for even deeper integration with WordPress through their collection of optional Add-Ons. 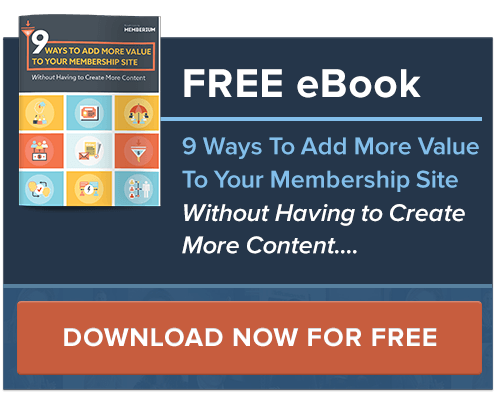 Build and publish your WordPress forms in just minutes. Quick and easy form-building. Select your fields, configure your options and easily embed forms on your WordPress powered site using the built-in tools.